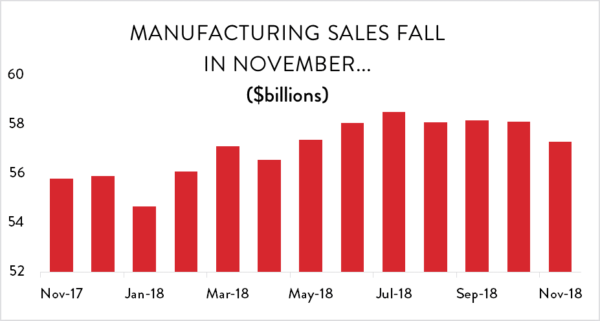 Low crude oil prices and production declines in petroleum refining hit the manufacturing sector hard in November, driving overall monthly sales down to their lowest level since April. While sales were up slightly outside of refining, a widespread drop in new manufacturing orders signals slower activity ahead. All told, manufacturing sales fell by 1.4 per cent in November to reach $57.3 million. That represented the largest month-over-month drop in output since last January and the third decline in four months. Sales in November were 2.1 per cent below their July peak. 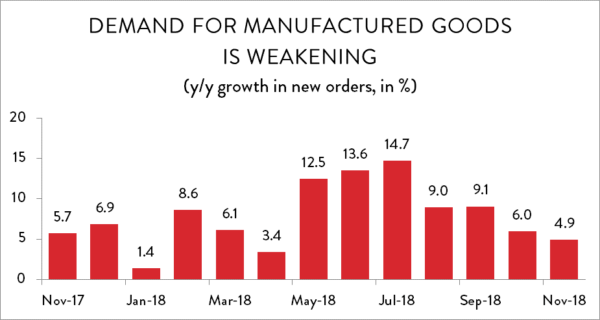 Even though sales were flat since the summer, year-over-year growth in manufacturing output had remained strong because of weakness over the same period last year. 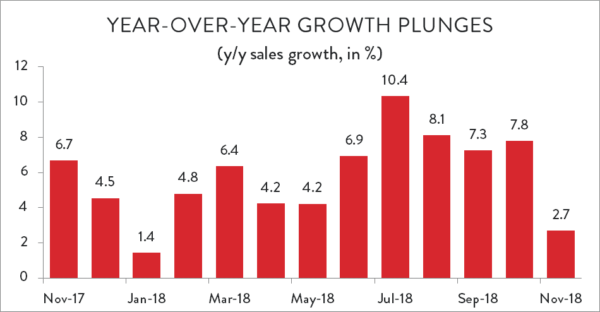 However, that changed quickly in November as the sharp decline in 2018 matched up against a solid increase 12 months prior. As a result, year-over-year growth plunged from a healthy 7.8 per cent in October to just 2.7 per cent in November. The good news is that manufacturers remain on track for a (nominal dollar) record year in sales. Through 11 months, total sales in 2018 are sitting at $630 billion – within spitting distance of the $651 billion in total output for all of 2017. Annual growth is tracking just shy of 6.0 per cent and should come in at about that level when December numbers are released in mid-February. As suggested above, November’s decline was driven by a combination of weaker prices and lower production in petroleum refining. Total physical output in manufacturing was down 0.9 per cent, with the remaining drop coming from price effects. While refining was the big story in November, it is worth noting that production volumes were weak across most major manufacturing industries. 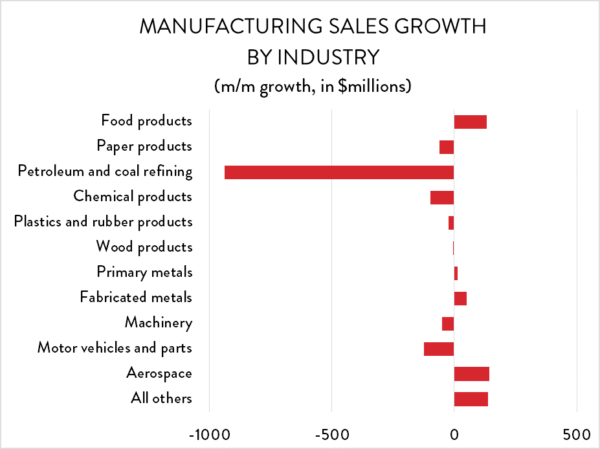 Of the eleven major manufacturing sub-sectors in Canada, seven saw output volumes decline that month. Adding to the bad news was a notable drop in new manufacturing orders in November. New orders fell by 2.9 per cent compared to October, hitting their lowest level since January. Although much of this drop can be pinned on refinery orders and a sharp decline in the volatile aerospace sector, it was not limited to those areas. Even excluding those two industries, overall new orders were still down 1.4 per cent and year-over-year growth is slowing considerably. The one small bit of consolation in forward-looking manufacturing indicators is that the backlog of uncompleted work remains high. Unfilled orders (not including aerospace) were flat in November and remain at their highest levels on record. 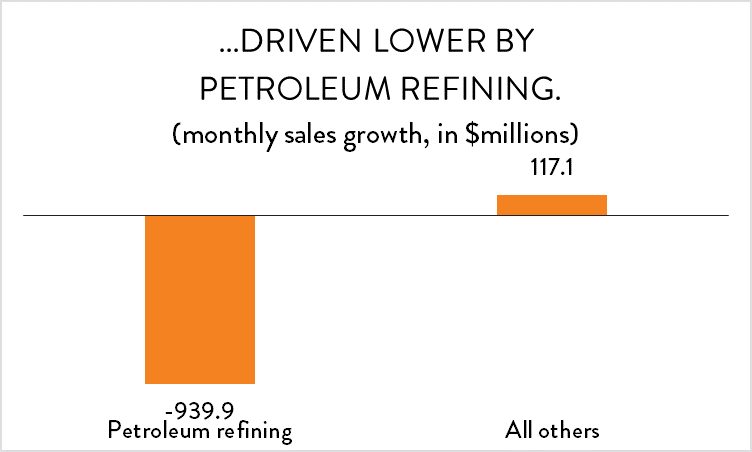 While November was a terrible month for petroleum refining activity, the news was a bit better elsewhere. The 1.4 per cent drop in overall manufacturing output (a decline of about $834 million) was entirely the result of a staggering 14 per cent drop in the refinery sector ($940 million). Removing that industry from the equation, overall manufacturing sales managed to eke out a 0.2 per cent gain compared to October. Even so, only four of Canada’s eleven leading manufacturing sub-sectors recorded positive growth in November. Leading the way were food processing businesses, which are climbing their way out of a hole dug this summer. Food processing output was up 1.5 per cent ($133 million) in November, bringing sales back up to April levels. Aerospace deliveries were also up in November (7.7 per cent), offsetting a comparable decline the previous month. There were also notable output spikes in a number of Canada’s smaller manufacturing industries in November, including shipbuilding, rail car production, and clothing. On the down side, sales of autos and parts were down by 1.5 per cent ($124 million), while paper, chemicals and machinery producers also saw lower production activity. Looking across the country, the bulk of the sales decline was obviously in Alberta. 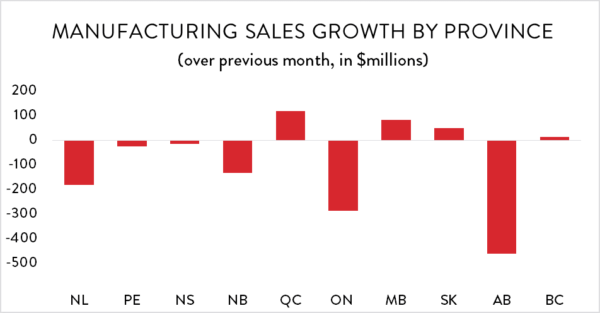 Manufacturing output in that province fell by 6.8 per cent ($458 million), wiping out six months’ worth of gains. However, sales were also lower in Ontario and down sharply all across Atlantic Canada. Lower motor vehicles and parts output helped drive Ontario sales down by 1.6 per cent ($284 million), while Newfoundland and Labrador saw output decline by a staggering 26 per cent ($181 million). On the positive side, manufacturers in Manitoba and Saskatchewan posted healthy increases, while aerospace deliveries helped Quebec recover some of its losses in October.